FREE Introductory R tutorial, Wed AM: RCurious will run free of charge for whoever is interested, and wants to upskill some before the conference fun starts. Following this there will be a newbies lunch, where you can match up with a conference buddy, if you would like. You still need to sign up for the tutorial, on the Programme menu there is a link to the sign up page. There is a data challenge with prizes. Tell us about Australia’s biodiversity using the Atlas of Living Australia data. More information is on the Programme menu. Discount AirTran tickets (to/from airport) are available with a code. Details are on the travel page. Keep up to date on progress by watching the tweets from @useR2018_conf - this is the place for frequent news and updates. Tutorials: The tutorials by Kevin Kuo, Thomas Lumley, Carson Sievert and Simon Jackson have reached max capacity. If you are just registering now and putting one of these as your first preference, you will get your second preference for the session. 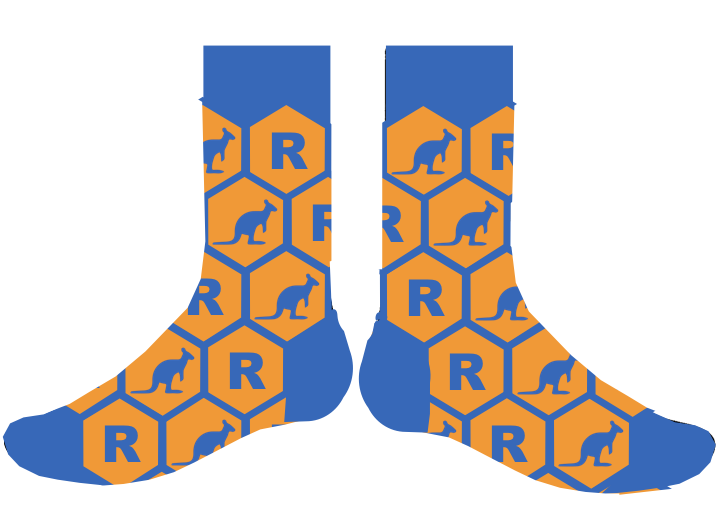 Swag: Register by May 31 to receive the conference socks. T-shirts are included for everyone, but no guarantees on size if you register later than May 31. Sock design is here. There is a long list of things to do in Brisbane and surrounds is on the web site’s Travel menu. Its a terrific place to to hang out, eat, drink, see wildlife, go on side trips to the beach, and the reef and world heritage rainforests. We are really appreciative of all the sponsors, and look forward to their participation in useR! 2018. These are Monash University Business School, Microsoft, RStudio, R Consortium, Brisbane Convention and Exhibition Centre, Brisbane City, VergeLabs, NAB, Alteryx, DataCamp, EMS, R Ladies, Statistical Society of Australia, Springer, Sage, CRC Press, and Symbolix. Links to their web sites are available on the home page. We are working very hard on putting the programme together, and hope to post a tentiave schedule by the end of May. If you have had an abstract accepted and haven’t yet registered, please to so asap.